This book for middle grade readers is the second volume in Joan Aiken's Wolves Chronicles. The Wolves of Willoughby Chase came first, published in 1962, and I loved it. Black Hearts grew on me but had a slow start and features a minor character from the first book whom I did not remember. Simon, who grew up in an orphanage near Willoughby Chase, has arrived in London, planning to study painting with Dr Field, an old friend from the orphanage. Dr Field is not at the address he had given Simon in a letter. In fact, he has disappeared but Simon manages to rent his rooms. All is confusion for Simon but he is plucky. He finds the school where Dr Field had taught and gets a job in a stable yard. He also acquires Dido Twite, the annoying daughter of his landlord, who later proves to be a stalwart friend. Meanwhile, in Aiken's alternate history, there is afoot a fiendish plot to overthrow the current King by a group of Hanoverians. The house where Simon is staying appears to be a sort of headquarters for the insurrectionist group. Once the story got going it was non-stop, involving many versions of mistaken identity including the origins of the orphan Simon. There is even a thrilling escape in a balloon! 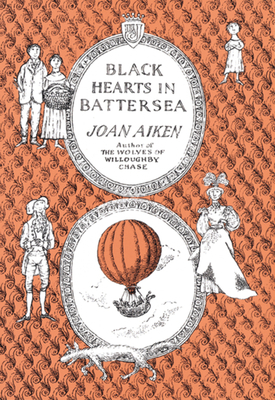 Joan Aiken has written many novels both for children and adults. She creates wonderful child characters. I was struck, as I was in the Newbery winner for 1964, It's Like This, Cat, how children in those older stories made their way about the cities where they lived. I think I carried that kind of confidence in my ability to roam my town growing up (with plenty of warnings not to talk to strangers or get into a car with a man I did not know) and it gave me a good start in life. After two books I am hooked on the series with its Victorian setting and Charles Dickens feel. If you know a reader aged 8-12 who likes historical stuff, these books would fit the bill. Well I'm not either. I think you would enjoy it. By the way, it's Book Lover's Day! I'm not familiar with this series but it sounds like something that 8-12-year-old reader could really get lost in. I first came across it because The Wolves of Willoughby Chase was always in stock at the bookstore where I worked and I just liked the title. Before that I though Joan Aiken only wrote for adults. I keep hearing about these books and thinking that I should read them. They sound like the sort of books that can be enjoyed by both adults and children. Especially adults who are young at heart! It is full of adventure and great kids! Orphanage & Orphan stories that have a Dickens feel -- seem just about perfect to me. Glad you found this author & let us know of her.